Djekic-Ivankovic, M., Jones, G., Kaufmann, M., Weiler, H., Plasma 3-epi-25-hydroxyvitamin D3 in Very Low Birth Weight Preterm Infants in Canada During the First Five Weeks After Birth. The FASEB Journal, 2015, April; 29(1 suppl):901.12. 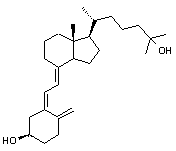 Applications: The inactive epimer metabolite of 25-hydroxyvitamin D3. Found in children less than twelve months of age with flawed vitamin D metabolism.